Hero Histories: Video Fridays: THE GREEN HORNET in "Eat, Drink, and Be Dead"
Video Fridays: THE GREEN HORNET in "Eat, Drink, and Be Dead"
In an interesting modern twist, the criminals use a helicopter to bomb any who oppose or betray them. Effective, and leaves no ballistics! When The Daily Sentinel begins a series exposing the racket, the gangsters grab reporter Mike Axford, threatening to kill him if the articles are printed. To save Mike, The Hornet cuts himself in on the racket, agreeing to turn Sentinel publisher Reid over to them in exchange for a percentage of profits. Once inside, Reid sabotages the operation, rescues Mike, and defeats the helicopter bombing-baddies. 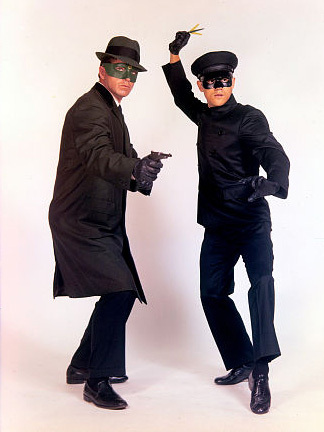 The Green Hornet series did quite a bit of location shooting during it's run. Last week it was a marina. In this episode, a huge local dairy. The Green Hornet likes to make use of darkness to make dramatic entrances. He does it twice in this episode! Another on-screen costume change as Britt Reid changes in the back seat of Black Beauty, this time donning his Hornet garb. Lots of play for The Black Beauty as more of it's gimmicks are introed, including built-in loudspeakers (with tape player so The Hornet and Britt Reid can seem to be in two places at once), smoke projectors (probably the gas projector seen in "Crime Wave" using harmless smoke instead of knockout gas), and the (rare for the time) mobile telephone. Plus, both the flying Hornet Scanner and the car's rocket weapons get a healthy workout. While the 60s tv series is not yet available on official dvd, it is available on YouTube. Here's the SIXTH broadcast episode "Eat, Drink and Be Dead" in three segments. Next week: a two-part episode in one blog entry!